Valencia is located on eastern coast of Spain, about 350 kilometers from Madrid and from Barcelona. The city is on the banks of the Turia river, in the Gulf of Valencia on the Mediterranean Sea. 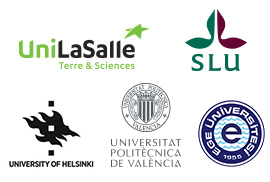 Valencia is well communicated with other Spanish cities and other countries by train, airplane (the airport is situated at only 8 kilometers from the city center), by boat (the port of Valencia is the largest of Mediterranean Sea) or by car. So, travelling around Spain or Europe is really easy having Valencia as base. Valencia is the third-largest city in Spain, with around 800,000 inhabitants in the city and up to 1,500,000 inhabitants in the metropolitan area. 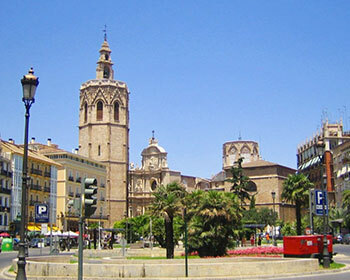 Its historic center is one of the largest in Spain. This heritage of ancient monuments, views and cultural attractions but also futurist buildings, makes Valencia one of the country’s most popular tourist destinations. Most renowned places to visit include The Cathedral and Queen square, Llotja de la Seda (Silk Exchange old market), City of Arts and Sciences, Oceanografic Turia River Gardens, etc. Due to its long history, this is a city with numerous popular celebrations and traditions. In March, the visitor can celebrate the Fallas, the main festivity of the city where the streets are bursting with music, flowers, firecrackers and fireworks. Alternatively, all Thursdays there is a public session at the gates of the Cathedral of the Water Tribunal of the plain of Valencia, which is a ruling for a millennia. Both the Fallas and The Water Tribunal are representatives of the List of the Intangible Cultural Heritage of Humanity. Valencia also has an extraordinary culinary tradition specially using ingredients from the rich orchards surrounding the city, the sea and the rice cultivated in the Albufera’s lake natural park, being the most internationally celebrated of all Valencian dishes the ‘Paella’.